A few minutes south of Paestum, at the southern end of the Bay of Salerno, is Agropoli. The name, clearly from Greek acropolis, does indeed mean "high city," but there is no evidence at all that the town is any older than the century following the fall of the Roman empire. The hill upon which the nucleus of the original town sits was probably first inhabited in the fifth century AD by Byzantine forces who were contending for Italy with great numbers of Goth invaders sweeping down the peninsula at the time. Two things stand out about Agropoli today. One is the Saracen castle, built by the Byzantines. 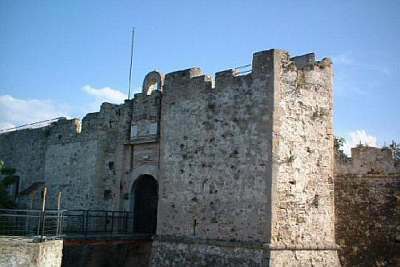 The term "Saracen castle" or "Saracen tower" is used throughout the coastal regions of southern Italy to describe hundreds of watch towers built by the various rulers of the Kingdom of Naples, first to watch for Arab incursions in southern Italian waters and later for Ottoman Turks. "Saracens" thus became a generic term for "Muslim pirates." Interestingly, the Saracen castle in Agropoli was actually inhabited by Saracens—and for quite a number of years (from 882, when they took it from Byzantines, to 1028 when they were finally expelled by the Normans). Remains of Arabic inscriptions attest to the Saracen presence in Agropoli. The other interesting point about Agropoli is the fact that the original city, the area high on the hill surrounding the fortress is still inhabited. In fact, there are even ‘for-rent’ signs, evidence perhaps of the town’s significant renaissance in the age of mass tourism. After all, there are good beaches nearby, so why not hole up for a summer high on an ancient fortress hillside? The castle, itself, is now a private home, museum and convention center of sorts. You can visit it by just ringing the bell, thus bidding the lord of the manor to grant you entrance. (If that doesn’t work, threaten him with your cross-bow. A small fee will also do nicely.) You can do the obligatory drawbridge and dungeon tour —failing, of course, to keep your merlons and crenels straight— and then stop and rest, still high on the hill and sheltered by the bulwarks of the castle, itself, at one of the pizzerias and restaurants that the inhabitants have seen fit to add in the last 1,500 years. Then, meander down to the newer parts of town on the lower slopes, appreciating how urban expansion must have changed as castles on high ground gradually lost their strategic importance.